Capricorn is considered especially compatible with Scorpio, but also works well with Pisces, Virgo and other Capricorns. People born under the sign of Capricorn celebrate birthdays between December 22nd and January 20th. The rest of the month of January falls under the sign of Aquarius. 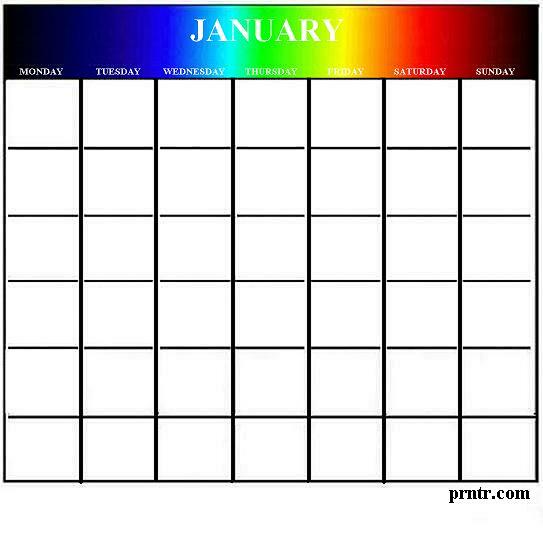 This page features an everlasting January calendar. Fill in the dates and years of your choosing. To print this calendar, just right-click on the image and select "SAVE PICTURE AS" from your drop-down menu. This will save the image to your picture file for future reference. From there, you can reduce, enlarge and manipulate the image as needed. The name January is derived from the Latin word "ianua," meaning door. The name refers to the Janus, God of the Doorway. January is known as the door to the new year, being the first month of the year in the Gregorian calendar. Special days acknowledged during the month of January include New Years Day on January 1st, Martin Luther King Day (3rd Monday in January), Inauguration Day (January 20th or 21st in the USA), Coming of Age Day (2nd Monday of January in Japan) and Australia Day (January 26th in Australia). January's birth stone is the Garnet. For the next month's calendar, other assorted astrological designs and many more free printable items, visit any of the links on this page. Hit this link for a Free Printable list of Amtrak Train Stations in All 50 States.